Merry Christmas everyone! Just want to encourage you all there that there is literally no excuse for not gettting festive with your kids in the kitchen this holiday season. You can always wait until you have the time and energy to make everything from scratch but for some of you (like me! 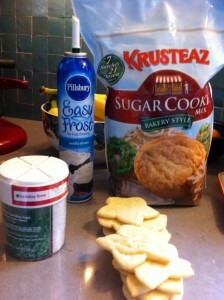 ), that time can be ever elusive and baking can seem like an overwhelming prospect. The above pic is one example of how I jump right in with the kids, shallow end first. I baked a batch and after school everyone will frost and sprinkle for a post-tree outing treat! So fun! I found Gingerbread mix this year that we will be using to make a Gingerbread Nativity! My husband always says “do not let the perfect be the enemy of the good.” It’s beautiful to see you live that. Thank you for a refreshing post, thank you for being real! Sounds like fun! Cheers to you all! We are doing cookies tomorrow. I’m mixing them now. So true! Waiting to be able to do everything from scratch sometimes means no cookies for the kids! Thanks for the encouragement to let go of some idealism and have some store bought fun! That Easy Frost looks too fun! Thank you for aleeving the guilt of not making things from scratch all the time ;0) In order to make fun things happen with lots of littles ya gotta cut a few corners. Thanks for keeping it real! If I bought that frosting most of it would go straight into my kids’ mouths without ever even nearing the shadow of an actual cookie.